Goal: Set up and run traffic to a web server. In this test scenario, LANforge-FIRE is used to generate traffic in the form of URL requests in order to determine the maximum number of URLs/second the web server can process. Please note that the web server used in this example is an isolated Linux system running Apache. 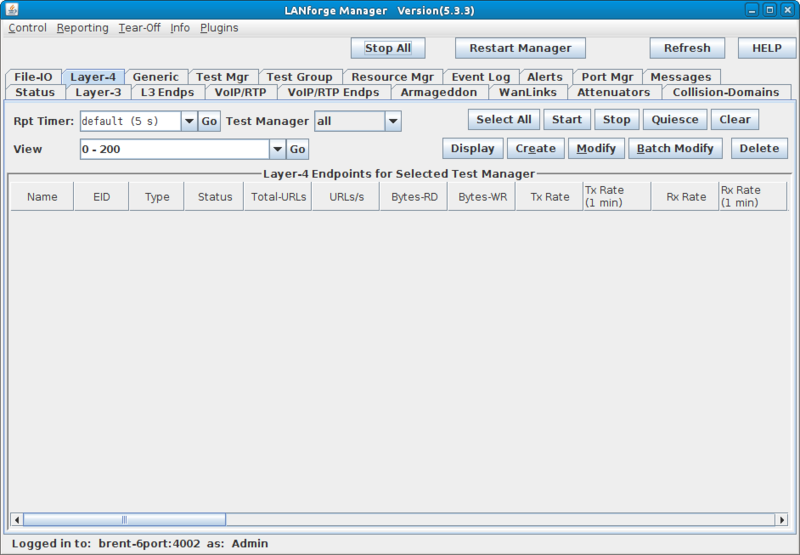 Connect one LANforge-FIRE port to the web server's network. Set up the LANforge port so that it has a valid IP address. 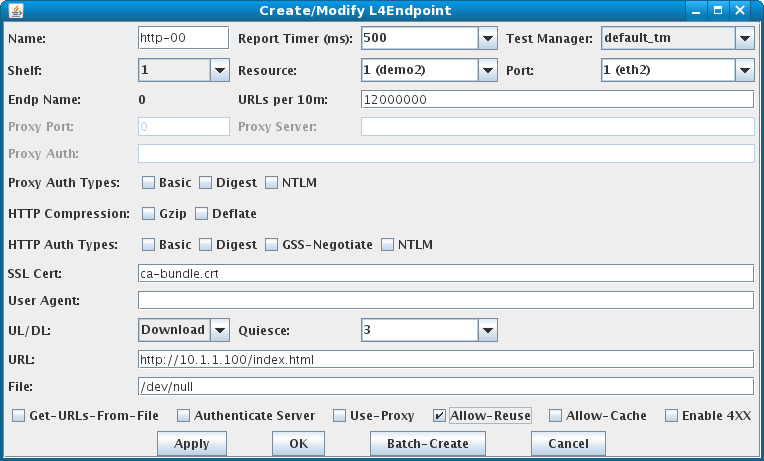 Modify the port connected to the web server. Set a valid network IP address and Gateway IP. Set up the URL requests. URL should be set to the web server's IP address and file that you wish to download. In this example, index.html is a small test file. File is the designated location that the downloaded file will be stored. In this example, we use /dev/null which will essentially throw the file away so that it does not slow down the LANforge system with writing files. Set the Quantity to 9, Number of Digits to 2, and Port Increment A to 0. Then click Apply. 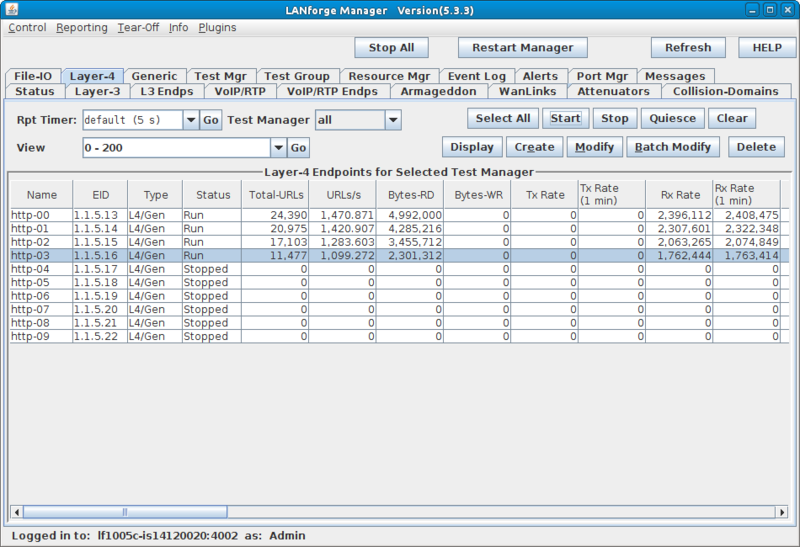 Run traffic and determine web server performance. As each endpoint is started, the rate of URLs/second will start to converge on a rate that the web server is capable of providing. Finding the final web server performance rate is a matter of adding up the rates of all running Layer-4 endpoints. 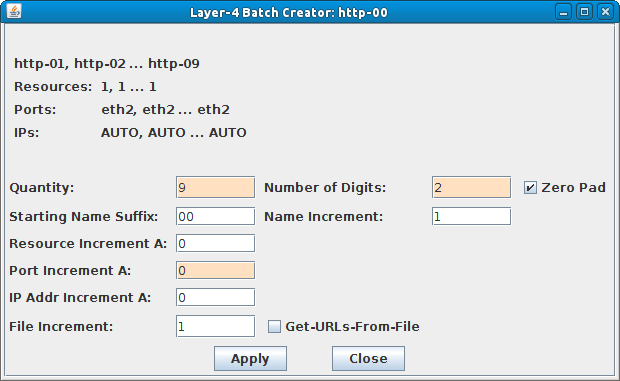 Several Layer-4 endpoints (10 in this case) are used so each endpoint can make an independently large number of URL requests without having to wait for too many replies. Each URL request is waiting for a reply from the web server, so if only one Layer-4 endpoint was making requests, it would spend too much time waiting for replies instead of generating more requests. 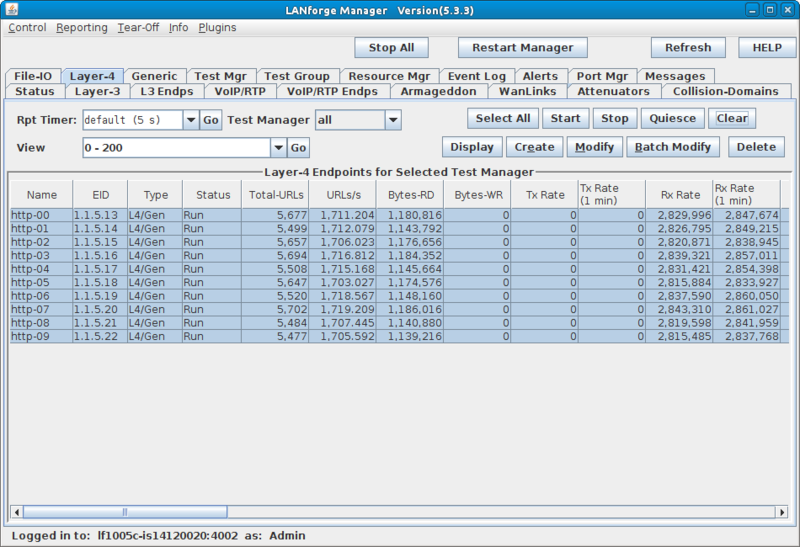 Spreading the URL requests over several endpoints allows each LANforge connection to the web server to maximize its rate of URL requests. After starting all 10 endpoints, and letting them run for at least 1 minute, the overall URLs/second rate converges to around 17,000 URLs/second.